May was such a busy month I didn’t notice how time passed by so quickly I forgot that a couple of days ago it was ISKAndals.com’s 8th birthday! Woo hoot! What’s new in my kitchen for the past year? Hmm quite a lot when I think of it. I moved to a new kitchen that’s close to nature – our place is literally at the foot of a dormant volcano! – and I became best friends with the oven. A few small but cheap gadgets acquired (like a stick blender) and even have a new coffee maker. Tried recipes from 3 cooking shows out of 4 I watch just this year! My my… I had been busy. So I thought I should take a quick break and write something today. 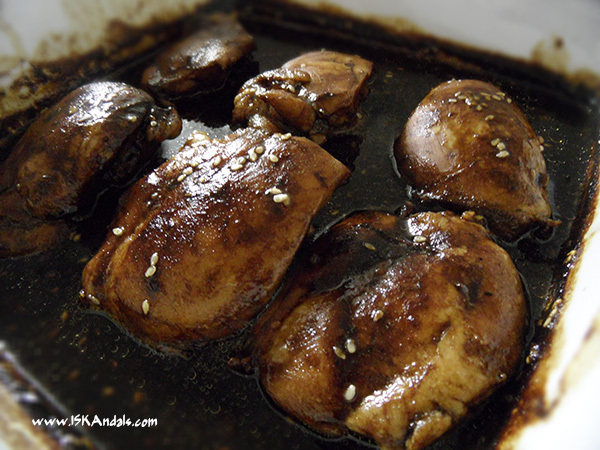 Here is one of my new favorites – baked honey-soy chicken. The how-to’s I got from the pages of a magazine at my doctor’s clinic few months ago. (Nothing to worry about – standard check-ups and my BP is always good). During those few minutes at the doctor’s waiting lounge I have this habit of going straight to the recipe pages. As you can see, they’re tasty, tender, moist and juicy. The meat is melt-in-your-mouth. I like serving the pieces on top of steamed rice or sliced served with vegetable salad. 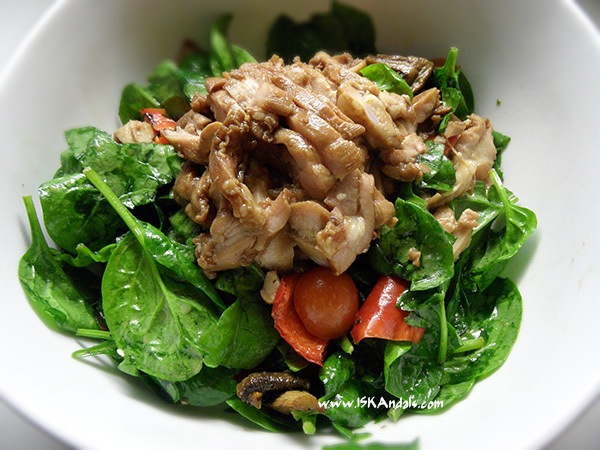 On the photo below I had them with baked mushrooms and red capsicums, fresh baby spinach and cherry tomatoes, with mustard and olive oil dressing. 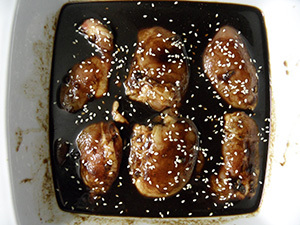 Preheat oven to 160 deg C.
Mix stock, soy sauce, tomato paste, honey and garlic in a baking dish. Throw in the chicken pieces and combine to coat chicken evenly. Arrange chicken so each piece has one side up. Sprinkle with sesame seeds. Bake for about 40 minutes turning every 10 minutes. Rest for at least 5 minutes before carving. Lovely served with steamed rice or sliced with vegetable salad. This is one great dish. I love how you serve it…with veggies as its beddings…very creative and it looks temptingly delicious.I have one great chicken recipe too..perhaps you might like it. 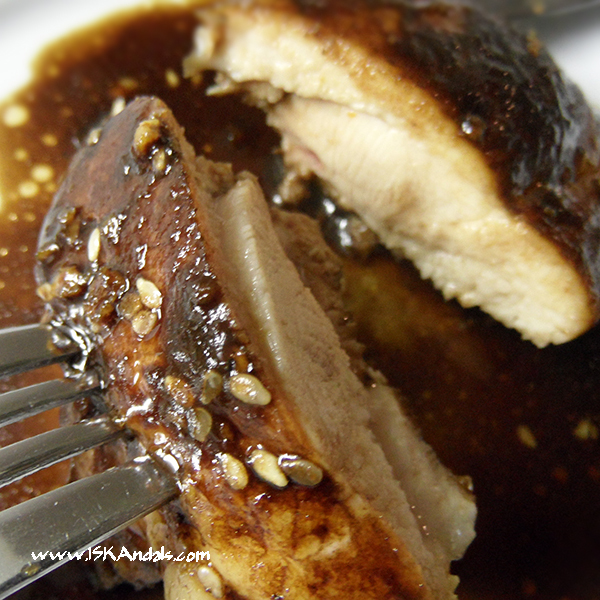 I brought it at Food Trip Friday too…Chicken Breast in a Barbecue Sauce. Congrats, Iska! This is perfect with steamed rice! In this light bar, wasted energy is dispersed as heat through its base. quickly to have in line because of it. The AC adapters are identified to cost the battery in the laptops. After reveal research, you may be able to get yourself an incredibly best laptops to get for college 2014 deal. Annually, liquor sales to college students are over five billion dollars. In this information, we’ll discuss HP laptops and their current model line-up.